In 2018, respondents in Poland reported late payments less frequently than in 2017. However, the proportion of past due B2B invoices remains the second highest in the region and almost 60% of respondents said that this affected their businesses. Poland still has one of the highest average DSO recorded in the region even after a steep decrease in 2018. Despite extensive use of e-invoicing and the majority’s belief that this accelerates payments, there was only a minor decrease in payment duration for Poland this year. Bankruptcy and failed collection attempts remain the top reasons for write-offs and consumer durables is one of the sectors that generated the longest payment delays. Historically, respondents in Poland have been some of the most averse to selling on credit terms. 2018 survey results point to the same conservative stance with only 29.1% of B2B sales made on credit. There are more sales on credit terms to domestic B2B customers than to B2B customers abroad (31.9% versus 26.3%). Polish respondents said that they are selling on credit to their domestic B2B customers to nurture long-term business relationships and to reward their customers’ loyalty. At the same time, it is perceived as a method that enables businesses to grow domestically in a market where selling on credit is expected. The main reasons why Polish respondents would not offer a domestic B2B customer credit are, high economic or political risk (25.0% of respondents) and either the financial weakness or the poor payment behaviour of the customer (18.8% of respondents). Transport services are sold almost 100% by providing trade credit, these are the market requirements. Trading on credit with B2B customers abroad also seems to be aimed at maintaining business relationships and building relationships with new customers. Trust – associated with customer loyalty - seems to influence this decision. Respondents in Poland mainly refuse credit sales to their foreign B2B customers because of high currency risk (mentioned by 32.4% of respondents) and high economic and political risk in the customer’s country (mentioned by 27.0% of respondents). We are selling on credit because we would like to increase sales and gain a foothold in markets where we don’t yet have a presence. In 2017, 89.2% of respondents in Poland reported being paid late by their domestic and foreign B2B customers. This was one of the highest percentages in the region. This percentage was the same for domestic and foreign customers. This year, the percentage dropped to 86.0% reflecting a significant reduction in late payments by foreign B2B customers (81.6%). Late payments by domestic B2B customers rose slightly to 90.4%. The proportion of overdue B2B invoices in Poland is stable at 39.0% (38.8% last year). Similarly to 2017, the average proportion of domestic past due B2B invoices was higher than that of foreign past due B2B invoices. In 2018, the average Days Sales Outstanding (DSO) figure recorded in Poland is 75 days, 13 days less than in 2017. Despite the decrease, Poland’s average DSO remains much higher than the regional average of 59 days. Looking at the DSO trend over the next 12 months, most respondents in Poland (61.8%) do not expect any changes, 20.8% foresee a slight increase and 10.6% a slight decrease. Domestic B2B customers of respondents in Poland are given, on average, 31 days to settle their invoices. This is one day longer than in 2017. Foreign B2B customers are given, on average, 32 days – two days shorter than in 2017. 50.4% of the survey respondents said that they do not differentiate payment terms by domestic and foreign customers. Should they differentiate, 29.9% of respondents said that they would give their domestic B2B customers less time to pay. The main reasons for differentiating payment terms in Poland are internal policies, industry practices and the financial risk related to export transactions. Payment delays in Poland have remained largely stable in 2018, with an increase of one day reported in respect to domestic B2B customers (on average, 25 days) and a two day decrease for foreign B2B customers (on average, 23 days). 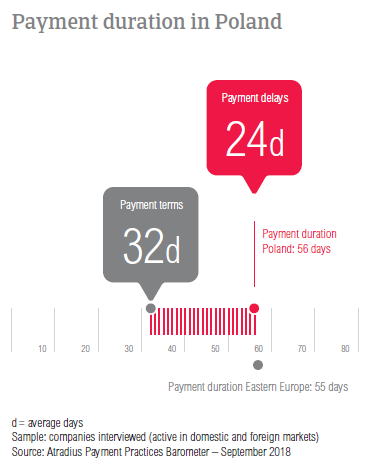 Based on these changes and the ones mentioned above, the payment duration in Poland decreased by one day, 56 days on average. This is also in line with the regional average of 55 days. Polish respondents said that domestic payment delays occur mainly because of insufficient availability of funds (reported by 62.2% of respondents) and buyers using outstanding invoices as a form of financing (32.3% of respondents). These show no changes compared to 2017, and are the same reasons as those expressed at the regional level. Payment delays by foreign B2B customers occurred mainly because of the complexity of the payment procedure (38.5% of respondents mentioned this). Respondents also mentioned insufficient availability of funds, buyers using outstanding invoices as a form of financing and that the goods delivered did not correspond to what was agreed in the contract (each of these reasons stated by 24.4% of respondents). Poland also had the highest percentage of respondents in the region (24.4%), who reported delays because the goods or services provided did not meet the contract agreement. This compares to 13.5% of respondents who stated this reason at regional level. 41.4% of Polish respondents said that over the last 12 months past due invoices did not have a significant impact on their businesses. 15.7% of respondents said that overdue invoices delayed investment in property, plant and equipment and another 15.7% that they needed to take specific measures to correct cash flow. A slightly lower percentage (14.7%) said that payment delays led to revenue loss. Respondents in Poland make extensive use of e-invoicing. 72.6% of respondents said that they are already invoicing their domestic and foreign B2B customers online and 12.7% said that they intend to start doing so in 2018. In contrast, only 13.7% of respondents in the country said that they are not using e-invoicing and 0.9% that they have stopped using it. Of the respondents already e-invoicing, 53.3% said that after invoicing their B2B customers electronically, they received payments quicker. For 40.8% of respondents online invoices did not have a noteworthy effect on payment while 5.9% of respondents noticed a slowdown in payment. Of four potential risks to global economic growth - US protectionism turning into a trade war, Fed policy becoming misguided, a ‘hard landing’ in China and geopolitical risk - Polish respondents said that US protectionism turning into a trade war is the most significant risk to global growth over the coming six months. 38.4% of respondents in the country mentioned this, a slightly higher percentage than that registered at regional level (37.7%). Additionally, 25.9% of respondents in the country agree that US protectionism is a significant risk, even if not the most significant one. Only 15.3% of respondents in the country perceive US protectionism to be the least significant risk to global economic development. The average proportion of uncollectable B2B receivables in Poland is stable at 1.0% (no changes compared to 2017). Similarly to what has been reported in the past, domestic B2B receivables here were written off as uncollectable more frequently than foreign B2B receivables. Uncollectable receivables originated most often from B2B customers in consumer durables, construction, chemicals, services and business services. Similarly to what was stated at regional level, the main reason for writing off B2B receivables as uncollectable is the customer going bankrupt or out of business. In 2018, this was stated by 62.4% of respondents, a much higher percentage than in 2017 (50.0%). The second most frequently reported reason for write-offs is the failure of collection attempts, stated by 39.3% of respondents in the country. B2B customers of respondents in Poland are given, on average, 32 days to fulfil their payment obligations. By sector, domestic and foreign B2B customers in the metals sector are given the longest payment terms (on average, 38 days) and those in the textiles sector the shortest (on average, 17 days). 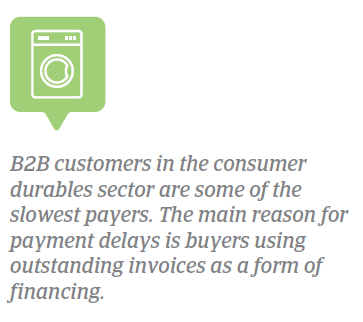 With an average delay of 27 days, B2B customers in the consumer durables sector are some of the slowest payers. 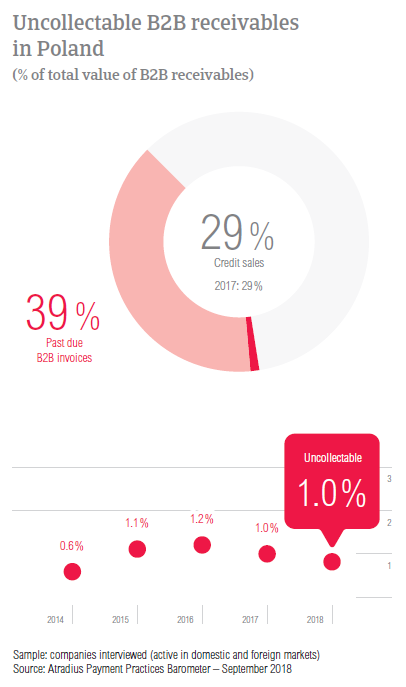 The main reason for payment delays in this sector is buyers using outstanding invoices as a form of financing (reported by 49.0% of Polish respondents). B2B customers in the construction sector also generated long delays (on average, 22 days) mainly because of insufficient availability of funds (54.0% of respondents mentioned this). 60.0% of respondents in the consumer durables sector and 62.0% in the construction sector do not expect changes in the payment behaviour of their B2B customers over the coming 12 months. However, they remain optimistic, should a change occur, most respondents expect it to be for the better.